Interviewing @AndreaHorwath for tonight’s @globalnewsto 530 & 6. Asked about the similarities between 1990 & 2018, she says “I’m not @BobRae48”. #onpoli Full interview tonight. Mighty Middle still in denial about Wynne's unpopularity. In ONE poll, one stat looked like that. The same stat showed an slightly larger number of Liberal supporters being attracted to "Ford Nation". You seem to be in denial about that. It's not as though Ford gained temporary enthusiasm from people who'd previously voted NDP in ONE election, but didn't gain supporters from any OTHER party. ​And since that ONE poll was taken, the ONDP support has increased in every poll, so obviously any support from one-time NDP supporters(as in people who voted ONDP in ONE election) must logically be declining. Nobody's ignored your point. What we've done is totally discredit it. We've proved that the ONDP isn't responsible for Ford's (now declining) lead in the polls. What response to your discredited talking point would make you STOP belaboring it? Not good, not good at all for them. What we've done is totally discredit it. We've proved that the ONDP isn't responsible for Ford's (now declining) lead in the polls. It is called being in denial. In ONE poll, one stat looked like that. The same stat showed an slightly larger number of Liberal supporters being attracted to "Ford Nation". It was by ONE PERCENT! and according to the margin of error, that is considered a statistical tie. At bare minimum, it was an equal to, and possibly slightly larger percentage. Could you at least explain why, when we're talking about ONE poll, it's a horrible thing that 20% of those who voted NDP in one previous election(and, for all we know, ONLY then, given that there's always a large bloc of voters that swing from party to party to party in EVERY election) said they identified with "Ford Nation"(in a context when "identification" does NOT necessarily equal voting intent)but that 21% of OLP supporters making the same identification in the SAME poll means nothing at all? ​Why does it matter that 20% of 2014 ONDP supporters said they identified with a concept, but nothing that 21% of OLP supporters identified with the same concept? ​Also, as has been REPEATEDLY pointed out to you, the ONDP vote share has sharply increased in the polls taken since then, so we can assume that that the 20% "identification" with "Ford Nation" no longer exists, or at least does not translate into actual voting intention. The narrative that MM has been obsessed with pushing, the narrative of ONDP supporters embracing "populism"(by which he essentially means "self-destructive, bigoted demagogy" does NOT exist. I don't need to deny that "working-class"(I assume by that that MM means "white, heterosexual, working-class men", since he clearly doesn't accept the reality that women, people of color and LGBTQ people are also strong components of the working-class)people are "swinging to Rob Ford" or "deserting the ONDP to vote for Rob Ford", or, as he'd really like to say "are becoming fascist, so to hell with the unions and bring on more layoffs", because there's nothing to deny. The TREND in the polls proves that any working-class "surge" to the PC's has stopped, as opposed to getting worse and working-class voters are actually surging to the ONDP. And it's particularly absurd that he gives us the story of ONE former ONDP figure who is campaigning for Rob. In every election that ever happens, you're always going to see at least one political figure get in a snit. Ontario in 2018 is not Germany in 1933. At bare minimum, it was an equal to, and possibly slightly larger percentage. Gimme a break if the roles were reversed you'd be saying it would a statistical tie. In addition there has been more than one poll showing Ford Nation poaching NDP supporters. In fact former card carrying NDPer and Jack Layton supporter (who supported him in the leadership) is now openly supporting Ford, and using his bully pulpit to convert other dippers into the Ford column. He is trolling neighbourhood in Brampton to turn those ridings PC. Wearing a “Make Ontario Great Again” baseball hat made by a friend, local resident Craig Bowman said he likes Ford’s focus on improving the business climate. Inside the bar, retiree Nancy Haskell said “he appears to be a down-to-earth type of person and I think that’s what we need … someone who can see what the common person is going through. Why didn't the Liberals change their leader while they still had a chance? I wonder how many voters are now considering climate change as a component of the healthcare issue? I hear Ont Libs are making death bed conversion to proportional representation supporters. 20 some seats looking lot nicer than 2 they would currently win. Given that @fordnation strongly supports privatization of Hydro One, can someone explain how he as premier plans to "fire" the CEO of a private corporation? This is unbelievable and could not have come at a worst possible time for the Liberals. The NDP should announce NOW that if they win the election their first piece of legislation would be to unprivatize Hydro One. Desperate times I suppose call for desperate attacks. Who knew that all of their blood, sweat and tears would just drive voters to Horwath? Maybe she will send them a fruit basket when this is all over as a thank you. Only one option for anti-Ford voters. where are the anti Ford websites? If that's true about the results of Howarth's health-care policies(ie. Americans can drive up and get free health-care), I'm pretty sure the plan would never be implemented anyway. Or, implemented and quickly cancelled, the minute a video hits You Tube of some pot-bellied Yank in a ballcap sitting in a doctor's waiting room and insulting Canadians, while he waits for his Ontario-taxpayer funded medical care. One poll...weeks ago. In the polls that actually matter, the ONDP is surging and the PC's are flatlining as best. Obviously, if the NDP is now at 35%, that's mathematically impossible. And when it was a thing(in ONE poll, just one)the same poll showed 21% of 2014 OLP voters saying they were "Ford Nation", too. Yet you pretend that THAT didn't matter. ​When are you ever going to stop spamming an outdated and now meaningless statistic? OR making a big deal of ONE former ONDP guy doorbelling for Ford in ONE neighborhood? The recent polls prove there's no NDP surge to Ford at all now(the PC's are lower than they were when Ford won the leadership) and that the PC lead is vanishing. 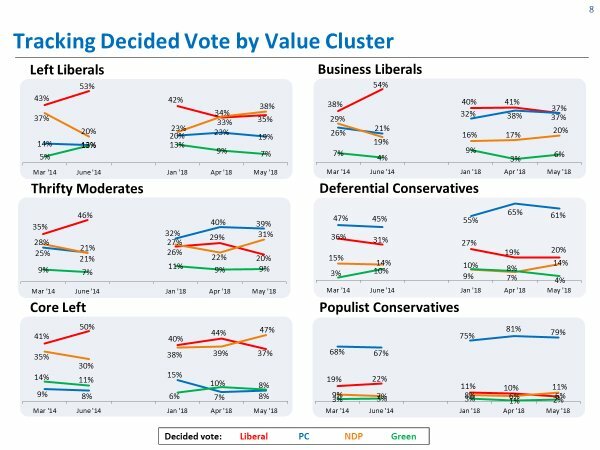 #onpoli 4/4 Hard to see a Liberal bounce-back strategy. There is no simple contrast message to rally the conflicting value clusters. Economically alienated voters are mad and not listening. The last hope is a brand appeal to get voters who feel like Liberals to vote Liberal. See? You just admitted that your whole agenda was to pressure ONDP supporters to vote Liberal. I think you have done everything but state your bias, almost like you are ashamed. A poll shows an equivalent leaning of Liberals and NDP, yet you restate (and restate (and restate)) the NDP information and come up with senseless quibbles when it is drawn to your attention that you are totally ignoring the Liberal information in the same poll. Babblers here had previously dismissed certain pollsters as being bias and being in bed with the Liberals. Now all of a sudden, when they show a surge in NDP support. That narrative (pollsters being in bed with the Liberals) has been tossed out the window, and now these same pollsters are to be believed 100%. So if (and I say IF) these same pollsters show Jagmeet Singh in a freefall, don't go around saying they are in bed with the Liberals. Because you can't say one year (2018) you believe what all these questionable polling firms are saying. Then turn around a year later and accuse the same polling firms for being in bed with the Liberals! This appears to be a deleted tweet from Anne Ayotte @Annie4NorthON (formerly @annie4wo), who is running the campaign of Clifford Bull (@votebull2018), Doug Ford's candidate in Kiiwetinoong. Note that she is calling for the eradication of people, not beliefs. The only bias I have is against the repeated posting of discredited polling analysis. We've all proved that there's no singular surge of NDP voters towards Ford(and in fact, the most recent polls prove that there's no longer any surge of ANY votes to Ford) and that, in the ONE poll that appeared to support your assertion, there was an equally large if not slightly larger indication of OLP voters swinging, at that time, to an identification with "Ford Nation" Given that the ONDP is polling ten points above the vote share it received in 2014, its mathematically impossible for a GROWING number of ONDP voters to be switching to the PC's and therefore that there's no reason for you to keep repeating the "20% of ONDP voters" stat when that stat is now outdates and when there's no reason ever to have singled out ONDP voters as you did at all. Why is it so important to you to keep pretending that the NDP base is somehow surging towards Ford when the polls clearly indicate that that's NOT happening, and when the convergence in the polling trends strongly suggests that they are accurate. Why was it ever that important to you to keep using the 20% stat as a talking point anyway? What was your purpose? What argument were you making in the service of that? I acknowledged at the start of the campaign that the ONDP was in third place and that the PC's were, at that time, way ahead. It's not my fault that OLP support has collapsed, and it hasn't helped Ford THAT OLP support has collapsed. I'm going to have to ask you to stop slandering the working-class voters of Ontario with the false accusation that they are surging to the party of the demagogue. If they WERE doing so, the party of the demagogue would be increasing its support in the polls, not slowly losing its ground. Working-class Ontarians are seeing through Ford. They are turning away from him. In the 2018 Ontario Budget, Premier Kathleen Wynne revealed the Liberals’ destructive plan to take over TTC Subway lines from the City of Toronto. If this scheme sounds familiar, it is because Doug Ford and the Progressive Conservatives are also calling for the same, which is nothing more than a backdoor plan for the province and Metrolinx to privatize the cornerstone of Toronto’s public transit system. The ‘glimmer’ refers to the possibility that we can do some education and mobilization with working people who use transit in Toronto, along with our allies in the union movement – and in particular, ATU Local 113 members – to raise the key issues behind our movement: increasing and providing stable operational funding for the TTC; keeping it public; increasing accessibility by building rapid mass transit throughout the city and in particular, working class neighbourhoods; reducing overcrowding and lowering fares for all, but especially people living in poverty and lower incomes. Like so many of us, who are not tied to one of the political parties, TTCriders, as a transit user’s organization, is working to build a broader, deeper and more effective movement through the election, and in the process, help influence voters to “vote for transit”, and away from the possible (and now probable) mess that could result from the election of a Ford-led government. – A Vote Transit Report Card, that includes the positions of four parties (PC, NDP, Liberals and Greens) on a series of key transit issues: funding better TTC service; commitment to lower fares; building more transit; keeping it public. Not surprisingly, the PC’s fail miserably on all of the issues. The NDP gets a green light on most, but a ‘yellow’ light on promising to fund more transit (they haven’t committed to a specific figure they would spend); the Liberals refuse to commit to any stable funding or keeping transit public, while they get a ‘yellow’ light for some funding and commitment to building more transit; the Greens get a green light on all of the issues. You are the one that continues to be in denial about Ford Nation being made up of 20% of NDP supporters. If you want to continually to be in denial about it, then so be it. And I have the polling from Rob Ford mayoral days to back it up. Why does Horwath have the momentum? Because the media and pollsters are driving the narrative that the NDP is the only one who can beat Ford. Last election the media and pollsters were driving the Liberals momentum. 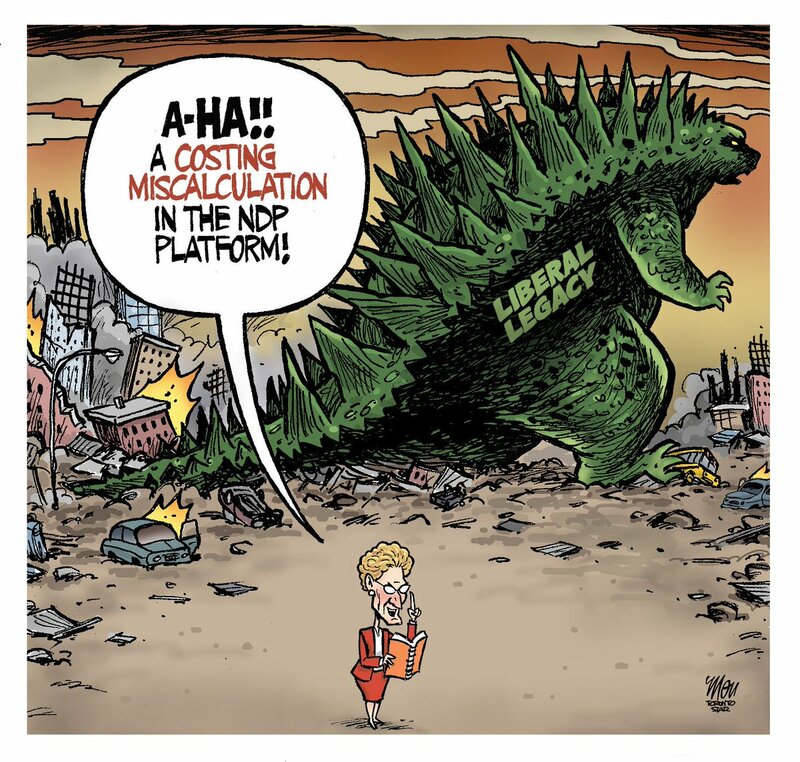 This time it is the NDP that has the moumentum narrative. Next time the media and pollsters might swing back to the Liberals or even the PCs if they have a more moderate leader. It is all cyclical. You may want to sit down before hearing this. When he was alive, he was mayor of the city of Toronto, elected under a system without parties. He was not his brother Doug, leader of a provincial party, running to be premier of Ontario, a province, as leader of the Progressive Conservative Party. Even if the poll you have -- about Rob, the dead mayor -- was accurate, it has no bearing on what percentage of historical NDP supporters have moved over to backing Doug (the provincial PC leader) in this election. You've used the term "Ford Nation" to attempt to obscure this, along with some handwaving about how populists convert people for life. Do you have any polls from this year (I'll be generous and not require they come from the election campaign, during which there's been a substantial rise in NDP support) that indicate what percentage of people who voted NDP in 2014 are voting PC in 2018? 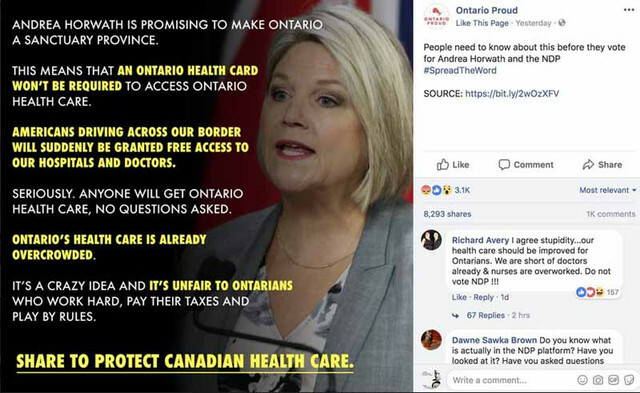 Don’t you think that perhaps Andrea Horwath herself, the NDP platform, and the voters might have something to do with it as well? After all Andrea is the most popular of the 3 Leaders, isn’t she? And yet Doug Ford is recycling Rob Ford old election signs for this campaign as they say FORD NATION. And he won the PC Leadership on the support he pulled from Liberal and NDP supporters in the 2014 Mayoral race. In one poll (for Missausuga Mayor) the pollsters threw in Doug Ford name, even though he wasn't running for Mayor there, just to see what would happen and Ford came in 2nd! As studies have showed, once a populist politician gains support from a voter, that voter sticks with them. Even if they leave politics for a bit and then come back. NDP polling has been flat and stuck in 3rd place since 2014. It was only when questionable polling firms started touting her as the anti-Ford candidate, then the momentum started. It is all cyclical, and this election the media & pollsters are in Horwath corner. So enjoy it, because next time they might be in the Green Party corner! Populist politicians tend to use straightforward messaging that caters to someone’s emotions, said Stephan Lewandowsky, a cognitive scientist at the University of Bristol who studies the spread of fake news and misinformation. “They’re simple messages that promise solutions and appeal to emotions. In a world that is incredibly complex … a lot of people find the pace of change difficult to cope with … that’s when simple messages become attractive,” Lewandowsky said. Ford’s candid and brazen approach to politics has won over Gordon Hazelwood, 52, who owns a small print shop in his hometown of Hamilton. “No surprise I’m also a Trump supporter. You can quote me on that,” Hazelwood said. “Ford is just being a regular person up there. He’s speaking normally. He’s speaking from his heart, as himself — not (as) somebody who wants you to hear stuff that’s scripted and, you know, the right way to say it,” he said. That goes beyond just repeating talking points — Hazelwood feels political correctness has gone too far and pervaded public policy, citing a recent report about Service Canada’s directive to avoid honorifics like Mr. and Mrs. and the All Families Are Equal Act in Ontario that swaps out “mother” and “father” for gender neutral “parent” on government forms. “We’ve been like this for centuries and nobody ever complained about anything. It seems the whole world is going that way, it’s too far,” he said. People may be more willing to give up the liberties ingrained in democracies because they feel like they’re losing their place in society, but those feelings have to be nurtured, Lewandowsky said. Lewandowsky said people’s perceptions on cultural and economic issues are exaggerated. People tend to think there are a lot more immigrants in the population than there actually are, though financial stress is more subjective. Populism may be a gateway to autocracy, but for now at least, Canadians don’t seem to be willing to give up on democracy as we know it. According to a Pew Research survey from 2017, Canadians generally think autocratic leaders are bad — 81 per cent versus 17 per cent who said they are good. That said, one in 10 said they thought the country should be under military rule. Ford Nation is a “strange coalition” that includes “immigrants and minorities but also people who don’t like immigrants and minorities,” said Michael McGregor, a political science professor at Ryerson University who heads a study of local elections in major Canadian cities. “Maybe the two groups don’t recognize each other, maybe they don’t care — the enemy of my enemy is my friend,” he said. McGregor’s national study of local elections includes a poll conducted just before Toronto’s 2014 municipal election, when Doug Ford entered the mayoral race to replace his brother, the drug-scandal-plagued incumbent mayor who dropped out at the time to focus on his health. People who identified as East Asian, South Asian and Eastern European were more likely than self-identified Canadians and Western Europeans to give Ford a high score when asked to rank a candidate’s likability out of 100. Ford’s approval rating was about 44 per cent among East Asians, 42 per cent among South Asians and 41 per cent among Eastern Europeans. He scored an average of 31 per cent approval among self-identified Canadians — which would include visible minorities — and about 32 among Western Europeans. McGregor noted Ford’s base in the 905 and Toronto suburban fringe tends to be low-income, high visible minority. “It’s this disaffected feeling (that) elites or people in power … don’t really care what people like me think,” McGregor said. Simon Kiss, a political scientist at Wilfrid Laurier University, gauged support among Torontonians for then-scandal-plagued mayor Rob Ford, using data from Ipsos’s 2014 provincial election exit survey. Visible minorities in Toronto were twice as likely to support the former mayor compared to white voters, Kiss said. Support was also higher among immigrants — those who were born in Canada were 34 percentage points less likely to approve of Rob Ford than those who had immigrated here. “They (the Fords) talk about getting taxes down, they talk about taking on the elites, they talk about being the voice of the people, they talk about being businessmen knowing how to run a government better ... in Toronto, Ontario, at least, that message actually resonates quite profoundly with visible minority voters,” Kiss said. Religion is also a key factor in support for the Ford brothers. McGregor’s research suggests Doug Ford did poorly among atheists. Kiss’s report also shows the most religious respondents were four times as likely to approve of the late mayor over those who skewed secular. Ayoola goes to church every Sunday and wholeheartedly believes Ford shares her religious, socially conservative values. “Why him? Because he has a family too and he has the same kind of morals that I do,” she said. What do the studies show about when they die and have a brother who enters a different level of politics?